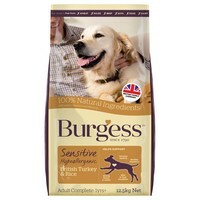 Burgess Sensitive Adult Dog Food (Turkey & Rice) is a premium hypoallergenic diet; perfect for dogs with delicate digestive systems. Packed with protein and amino acids for muscle development and growth, Burgess Sensitive Turkey has been made from only a few, simple ingredients such as succulent British Turkey and rice. Turkey: Highly digestible protein for good muscle formation and retention. Rice: A gentle carbohydrate which is a good source of energy. Beet Pulp: An excellent source of dietary fibre for digestive health and good stool formation. Linseed & Fish Oil: Rich sources of Omega 3 fatty acids for a glossy coat and healthy skin. Wheat, Maize, Beef, Egg, Dairy and Soya.